Rheology is the analytical technique of choice in studying polymers as it can correlate the absolute flow and deformation characteristics of a specific product, in relation to its behavior towards a particular application or processing step. Although rheology is an integral method, it is only able to provide data on the investigated sample’s bulk. It is unable to offer insight into what is going on at the molecular level at a given processing step. Raman spectroscopy however, has a proven track record as an effective, powerful and non-invasive means of chemical analysis. 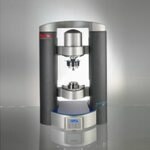 Linking a Raman spectrometer and a rheometer allows the user to acquire direct information on the molecular structure as well as on the mechanical properties of a sample. This combination is incredibly useful for the study of the crystallization behavior of polymer melts during processing, as well as providing a range of information for in-situ characterization and monitoring – something that can be especially challenging when working with on-line techniques where only relative flow fields are characterized. The results outlined below were obtained on an HDPE melt, in cooperation with NIST, that was previously published. The results shown can be acquired using the combination of a Thermo Scientific™ HAAKE™ MARS™ rheometer and a Thermo Scientific™ iXR Raman spectrometer (known as the MARSXR RheoRaman System). Figure 1. The Thermo Scientific HAAKE MARSXR RheoRaman System. A range of complex fluids relies on the phase transitions melting and also crystallization as part of their flow properties. These are temperature-sensitive transitions which are commonly indicated via changes in molecular conformation. On the other hand, optical measurements can provide direct observations of structural characteristics. When measurements are performed on separate instruments, they can be difficult to correlate because there may be variations in factors such as processing history, temperature control and the samples themselves. In order to highlight the MARSXR’s capabilities, the results provided here are concurrent Raman and rheological measurements on high density polyethylene (SRM 1475, National Institute of Standards and Technology, Gaithersburg, MD) during crystallization. The setup for the experiment shown illustrates an innovative integration of commercial instrumentation: a Raman spectrometer (Thermo Scientific iXR) and rotational rheometer (Thermo Scientific HAAKE MARS) are coupled through an optically transparent base that has been modified from the Thermo Scientific RheoScope Module. In order to monitor crystallinity, the user has to look at the Raman spectra for HDPE as shown in the chart below. Figure 2. Raman spectra of polyethylene at temperatures corresponding to the semi-crystalline state (22 °C) and the amorphous state (170 °C). The room temperature spectrum shows sharp peaks which correspond to the CH2 twist, CH2 bend and C-C stretch. HDPE is in the melt state at 170 °C, and here the sharper peaks are replaced with more broad spectral features. HDPE’s Raman spectra can be analyzed in order to quantify the sample’s crystallinity. Most notably, the area of the HDPE spectra that is under the peak at 1,416 cm-1 is directly proportional to the mass fraction of crystallinity within the sample. To effectively calculate crystallinity in this instance, the integrated peak area I1416 is normalized by the total area under the peaks within the CH2 twist region and a scale factor Nc. The scale factor Nc is a ratio of I1416/(I1296 + I1303) for an HDPE sample to the crystallinity of that sample measured via DSC. The measured scale factor for an HDPE on the MARSXR is Nc = 0.80 ± 0.03. While this is bigger than the calculated values of Nc from previous measurements, HDPE’s Raman peak intensities, and therefore its scale factor values are highly dependent on the state of polarization from the collected and incoming light, as well as the scattering angle. The crystallinity for the room temperature sample in the chart above is (73 ± 4) % which coincides with the crystallinity value of (74 ± 5) % measured via DSC. The MARSXR can simultaneously study the structure-property relationships during polymer crystallization – something that is of vital interest. Here, an HDPE sample with a thickness of 750 μm was heated for 5 minutes at 155 °C, then cooled at 10 °C/min to 134 °C, cooled at a slower rate of 2 °C/min to 124 °C and finally held at temperature to crystallize. The chart below illustrates both the Raman and rheological measurements during HDPE crystallization. A fixed strain amplitude of 0.01 and oscillation frequency of 2π rad/s were used to measure the complex modulus during small-amplitude oscillatory shear. The chart below highlights that the early times in the crystallization process are characterized by G’< G’’. However, over time a crossover happens in the modulus as the values of G’ and G’’ increase over 2 orders of magnitude. The plateau in G’ and G’’ at the later times indicates the end of crystallization as measured by the complex modulus. Figure 3. Complex modulus and crystallinity of PE versus time during isothermal crystallization at 124 °C. The Raman spectra that are measured during this crystallization process can be used to calculate the sample’s crystallinity by using the equation cited above. The chart above illustrates the immediate mass fraction of crystalline material, which first reaches above the measurement noise at approximately 800 s before increasing over time. Raman spectroscopy highlighted an appearance and increase in crystallinity, and this correlates with an increase in the complex modulus close to the crossover point. As can be clearly seen, phase transition in the SRM 1475 is driven by crystallization. Using multiple instruments to relate rheological and Raman measurements would be highly problematic because of the sensitivity of the crystallization process on temperature. However, by using the MARSXR, users can easily correlate changes in the complex modulus with conformational and structural changes in the crystallizing HDPE melt.